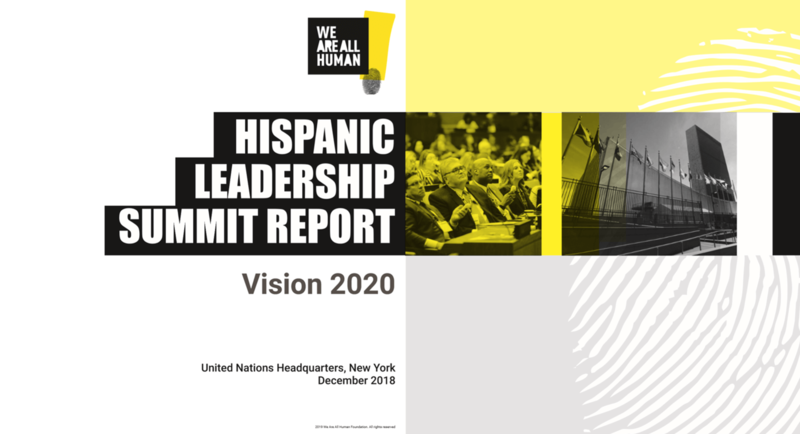 On December 10, 2018, leaders of the U.S. Hispanic community gathered at the United Nations for the first Hispanic Leadership Summit convened by the We Are All Human Foundation, a non-profit devoted to equity, diversity and inclusion. The summit explored the challenges the U.S. Hispanic community faces due to its continued underrepresentation in all sectors of society, including in the news media, despite being America’s largest diverse community – a market of more than 55 million, representing $1.7 trillion of annual purchasing power and more than 55 million Americans. The summit engaged participants in real-time polling and panel discussions, which were designed to surface the key challenges, opportunities and solutions they would envision themselves addressing as one U.S. Hispanic community – a Vision 2020 agenda for the future. Additionally, attendees drew inspiration from various research insights, including We Are All Human’s first Hispanic Sentiment Study, which surveyed more than 2,500 U.S. Hispanic and Latinx respondents . This report summarizes the summit’s key outcomes.